GALION — Looking for something to do in Galion this summer. This upcoming weekend is just one example. The Heise Park pool and the splash park facility at East Park are now open daily. With temperatures in the upper 80s this week, both sites offer a bit of cool, wet relief. The Galion Graders opened their 2017 season last weekend. With a record of 2-1 — as of Sunday evening — the Graders will be back in action at home Tuesday, June 13 against the Lorain County Ironmen before heading to Lorain to play the Ironmen again on Wednesday, June 14. On Friday, the Graders will host the Licking County Settlers at Huddleston Field in Heise Park before heading to Richmond, Indiana to face the Jazz on Saturday June 17. “Disney’s Beauty and the Beast” is being staged by local talent at Galion Community Theatre. Showtimes are 8 p.m. Friday and Saturday and 2 p.m. Sunday. Showtimes next week are the same. Visit the Galion Community Theater Facebook page for more information. You can purchase tickets by calling 419-468-2662. Also on Friday evening, local music troubadour Eric Barnett have a CD release show at the Eighteen-O-Three Taproom in Galion. Barnett’s CD is titled “Shipwreck in a Bottle.” The fun begins at 8 p.m.
Also this week — on Friday — is the second Third Friday in Galion event in Historic Uptown Galion. The goal of Third Friday in Galion effort is to get area residents to come to the uptown Galion area and see for themselves that there are things to do in this community. There are stores to visit; there are restaurants serving up excellent, well-priced meals; there are art galleries to visit; there are businesses in the uptown area that you probably have no idea where in Galion; and there are places to stop and get an adult beverage or two. 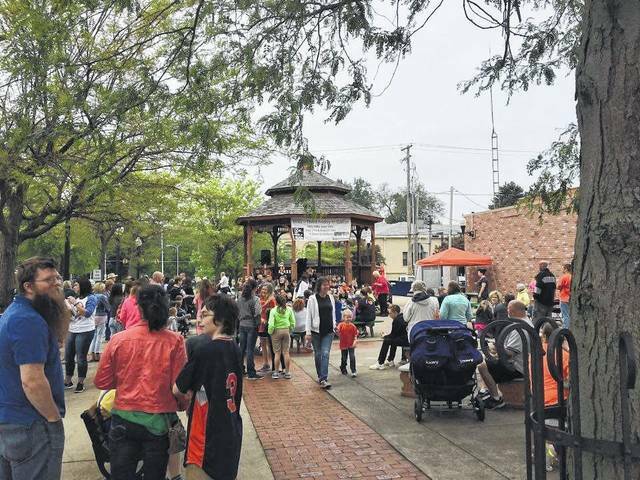 Area vendors will again set up across the street from the gazebo and many uptown merchants are planning to stay open late to give visitors a chance to see the kinds of wares, food and services theyoffer. This Third Friday event is loosely-based on safety. The Galion Safety Commission will have its regular monthly meeting near the gazebo, starting at 5 p.m. That meeting will include a demonstration on fire extinguishers. Galion business owners and employees will get credit for attending the safety commission meeting and the public is encouraged to watch the demonstration, as well. For more information on TFIG, check out the group’s Facebook page, or the Galion-Crestline Chamber of Commerce website. Also this weekend is something new for Galion. The Brush and Palette Art Gallery and the North End Garden Club are co-sponsoring this community’s first Home, Garden and Art Tour. The tour is intended to showcase of the some of the older, historic homes in the community and several of this community’s artists. It runs 1 to 5 p.m. Saturday. Artists and or original artwork will be featured at each location, which include: Brownella Cottage,132 S. Union St.; the Gill House, 342 Harding Way West; the Howard House, 230 S. Boston St.; the Galion Big Four Pavilion,127 N. Washington St.; the Fearn residence, 5198 Lime Road, Galion; the Neja residence, 515 Chestnut Place; the Groth residence, 6226 Crawford-Morrow County Line Road; the Heacock residence, 402 Euclid Ave.
Tickets are for sale at Brush and Palette Art Gallery, The Roseberry House, 114 Harding Way East. They cost $5 for anyone 12 and older. Those interested in the tour may also purchase tickets at each location on the tour. Everyone who gets their tickets stamped at five out of the eight locations will be eligible for a drawing of donated prizes at the Brush and Palette Art Gallery that day. And not to be forgotten, the Pickle Run Festival is just around the corner. It is July 1 and July 2 with most activities at Heise Park. This year’s festivities include many family-themed events on Friday and sporting events, vendors, entertainment. And it’s all capped off by the fireworks extravaganza on Saturday night. Email Russ Kent with story ideas or comments at rkent@civitasmedia.com.